Church Street in Champlain Village shows the old Noadiah Moore house and 1815 school building in an 1828 view as well as a later view circa 1908 showing School No. 1 and Methodist Church, both built around 1875. Photo courtesy Special Collections, PSUC and inset courtesy the Clinton County Historical Association. The 2011 calendar presents a comprehensive history of the founding of the four main settlements in the Town of Champlain: Champlain Village, Coopersville, Perrys Mills and Rouses Point. The thirteen large format photographs keep to this theme and present views of buildings and country road scenes from these communities. This is the first time in recent times that a complete history of Champlain Town has been given. The town was founded after two tracts of land were granted: the Moorsfield Grant (Smith and Graves Patent) encompassed one third of the town and was issued to Pliny Moore. Shortly afterwards, the Canadian and Nova Scotia Refugee Tract was issued to Canadian refugees who had served in Congress' Own regiment in 1776 and after. Pliny Moore settled Champlain in 1788 and 1789 and Jacques Rouse came to the lakeshore along with many refugees a few years earlier. By 1800, many more settlers such as Ebenezeer Cooper and George Perry came from the New England states and made settlements that now bear their names: Coopersville and Perrys Mills. The following is an abridged version of the essay. Considerably more information is found in the calendar. Champlain Town, now called the Town of Champlain, has a rich history. The town’s settlement dates to the end of the Revolutionary War when settlers from both sides of the border were allocated land by the State of New York after serving in the army. Starting in 1782, settlers came to the lakeshore and to the interiors of the town to take advantage of its untapped natural resources such as agriculture, timber and water power. Within 20 years, the principal villages and hamlets had been settled and Champlain was growing. To raise regiments for the defense of New York during the Revolutionary War, the state legislature, on March 20, 1781 and March 23, 1782, passed laws that appropriated land, depending on rank and time of service, to men who enlisted in the army. Pliny Moore, of Kinderhook, New York (near Albany), had enlisted in 1776 at the age of 17 and re-enlisted several times to earn several thousand acres of land. By July 10, 1783, twenty one soldiers in his regiment (later 17) were allocated land and Moore was appointed to find unappropriated land in the state, survey it and arrange for the balloting of the lots. After several unsuccessful attempts at finding land in western New York, he chose land in upstate New York in wilderness that was almost inaccessible by land. He applied for the 11,600 acre plot now called the Moorsfield Grant (or Smith and Graves Patent named after the first two names on the application). He surveyed it in the spring of 1785 and in the fall of 1786, he divided the grant into 119 lots and surveyed each lot. On February 6, 1787 the “Great Deed” was made by the state and Moore obtained (and purchased from other soldiers) 3,820 acres of land (40 lots) out of the 11,600 acres in the patent. In January of 1788, while still living in Kinderhook, Pliny petitioned the state legislature to create the Town of Champlain as well as Clinton County to enable better facilitation of legislative and judicial matters as his settlement was so far away from Albany. On March 7, 1788, “Clinton County” and the “Town of Champlain” were created as well as the towns of Plattsburgh, Willsboro and Crown Point. The law stated, in part, “And that all part of the county of Clinton, laying to the northward of the town of Plattsburgh, …shall be, and hereby is erected into a town by the name of Champlain.” At the time of its creation, Clinton County encompassed the present counties of Clinton, Essex, Franklin and St. Lawrence. The town extended to Vermont and included Alburg and Isle La Motte. This is reflected in the 1790 Census. On May 23, 1788, Pliny came to his Champlain settlement with several workers and land proprietors and built a sawmill near Perrys Mills and in February of 1789 came back with his wife and newborn son Noadiah and settled permanently in what is now the Village of Champlain. Elnathan Rogers and Samuel Ashmun, two of the original soldier proprietors also settled permanently and several settlers came around this time after buying other soldiers’ rights. The earliest settlers were William Beaumont, Joseph Rowe, Caleb Thomas and Murdock McPherson. The 2007 and 2008 Champlain Historic Calendar essays describe the settlement of Champlain Town in detail. For the next several years, a small influx of settlers came and settled on the lots in the Moorsfield Grant and the Refugee Tract within the Town. Land adjacent to the lakeshore and along the Great Chazy River was considered most valuable. There were many location on the Great Chazy River where sawmills, grist mills and fulling mills could be built. But the first large scale settlement would not occur for another 10 or 15 years and land was sold and resold many times before people settled permanently on it. Starting around 1800, hundreds of settlers came from Connecticut, Massachusetts, Vermont and central New York to settle on the wilderness lands that the original patent holders sold. The Hubbells came from Lanesboro, Mass, the Hayfords from Saratoga County, NY, the King family (settlers of Kings Bay) from Pittstown, NY, the Stetsons came from Cornwall, Vt, George Perry came from Middletown, Conn., Johnson Chapman came from Vermont, and the Pettingers and Rochesters came from England. Only between the years 1810 and 1814 did the population of Champlain shrink, this being due to the war. In late 1782 or in 1783, many French and Scottish soldiers and their families came from Canada and settled on the lakeshore and around the Great Chazy River. These soldiers had served in Brig-General Moses Hazen’s Canadian regiment starting in 1776. The troops were part of the regiment known as Congress’ Own because they were raised by an act of Congress on January 20, 1776 and not by New York State. Because these Canadians sided with the Americans, they lost their land in Canada and were forced to leave by the British after the Americans lost control of Quebec later that year. Because of the refugees’ predicament, the State of New York passed a law on May 11, 1784, that granted them land in what is called the “Canadian and Nova Scotia Refugee Tract.” The tract, 132,000 acres in size, encompassed the towns of Champlain, Mooers, Altona, Chazy and parts of Dannemora and Saranac. The tract was divided into 520 lots of 80 or 420 acres each and distributed among 226 soldiers. The amount of land received by the soldier was based on his rank and time served (similar to how Pliny Moore and his soldiers were allocated land). The Village of Champlain lies entirely in the 4.25 by 4.25 mile wide Moorsfield Grant. The original settlers in and around the village were Pliny Moore, Elnathan Rogers, Samuel Ashmun, William Beaumont, Caleb Thomas and Joseph Rowe. In 1810, Ebenezer Cooper, who originally was from Vermont, settled in Champlain Town after living in Chazy a short while. He settled on the west side of the river where his only neighbors were Eseck Angel and families named Ford and Broadwell. Cooper later moved to the river shore in 1817 after buying Benjamin Mooers’s land. He bought lots 120, 121 as well as the sawmill and grist mill for $3,200 ($44,000 today). Presque Asselin was one of the refugees who settled permanently in Champlain. When he came to town, he built a log house on the Great Chazy River. No one knows exactly where he settled but it was probably on either lots 90 or 109 which is along the river in the Moorsfield Grant (a map drawn by Pliny Moore in 1786 shows several huts built along the river; one of these is likely Asselin’s; see the aerial photo for the hut locations). Asselin was allocated 500 acres of land and purchased part of lot 3 from Pliny Moore on August 5, 1788. Pliny also sold part of lot 90 to Asselin, which included the river frontage, but Presque sold this land to a Trahan in 1790. Presque lived on part of lot 3 on what is now the Mason Road near Clark Road north of St. Joseph’s Church. It is likely that Asselin could speak English as he was active in town politics since its inception. In 1793, the annual town meeting was held at his house and he was elected a commissioner of the highways along with four others. By the 1830 census, the name of Asselin had been changed to Ashline. Many of Presque’s descendents still live in the area. In 1800, George Perry and his wife settled west of Champlain near Mooers after buying 105 acres of land from Benjamin Mooers for $210. Perry was born in 1777 and lived in Middletown, Connecticut, previous to his arrival here. After arriving, he became interested in running a mill and in September of 1803 asked Pliny Moore if he could lease his mill. He noted that the Platts of Plattsburgh had this arrangement with other people. An agreement was made and in September of 1806, Perry wrote that he would continue Moore’s clothing business like he did the previous season. By 1811, Perry had entered politics in Mooers and was supported as a Republican running for the State Assembly. In 1814, he was one of three appointed by the Republican Committee to represent Mooers and promote the Republican candidates that were to be nominated. The fist British proprietor of the northern lakeshore now known as Rouses Point was Colonel Gabriel Christie, a British soldier living in Quebec. A description of the land he purchased is as follows: “…a tract of land extending from the 45th degree of northern latitude, to one league [3 miles] south of the great river Chazzy, on the west side of Lake Champlain, by three leagues [9 miles] in depth, together with the island LaMotte, opposite to the said tract.” Christie had purchased this land in 1766 or earlier but the State of New York, after the Revolutionary War had ended, contested his claim. When Pliny Moore chose the location of the Moorsfield Grant, he purposely put it three miles to the west of Lake Champlain (which appears to still be on Christie’s land). Rouse supposedly had three wives and a total of 26 children but only eight of them survived to adulthood. His first wife was Clara Therese Olivier, adopted niece of Major Lawrence Oliver (or Laurent Olivier) who he married at age 14 in 1780 in Albany, New York (Hazen’s regiment was at this time in various places in New York as well as in Pennsylvania). Oliver (Olivier) also accompanied Rouse to this area and settled on the lakeshore. Rouse’s oldest child was Lawrence but he drowned in the lake at the age of 14 around 1800. Other sons were Lewis (born around 1792), Solomon M. (Simeon?, born in 1795 and died in 1860 in Wisconsin) and Michael. Daughter Clara married Eddy Thurber of Rouses Point. Other daughters were Julia and Sophia. His last surviving child was Mary who married Charles White of Rouses Point. She died in 1868 and is supposed to be in Maple Hill Cemetery (note that there could be more children of his not listed here). Grandchild David White (1831-1902) was the engineer in charge of building Fort Montgomery and Eleanor (White) Luck was his sister. David was unmarried but Eleanor had children whose descendents may still be in the area. Rouse’s son Lewis settled in Green Bay, Wisconsin, after serving in the War of 1812 with his brothers Michael and Solomon, and worked for the American Fur Company. Hugh McLellan corresponded with a few descendents of Jacques Rouse between the 1920s and 40s. At the time, there did not seem to be any of his descendents living in Champlain Town. The boundary of the United States in Champlain Town had been a source of contention for the first half of the 19th Century. This was due to the inaccurate determination of the 45th parallel which was the stated boundary between New York and Quebec. Once the boundary was inaccurately marked, numerous land surveys based on this location were made and more survey errors propagated. This culminated with the building of Fort Blunder on the wrong side of the border. After the conquest of French Canada by the British, the King of England declared by Royal Proclamation in October of 1763 that the boundary of the provinces of New York and Quebec was to be the 45th Parallel. In 1766, the Governor of New York, Sir Henry Moore (no relation to Pliny Moore), with the assistance of the Quebec governor, agreed to survey the boundary to establish its true location. On August 12, Moore wrote of his desire to mark this line: “From the Mohawk Country I propose to go to the north End of the lake Champlain, in order to ascertain the boundary line between Quebec and this Province, which by His Majesty’s order is fix’d at the 45th degree. The great expense which has been occasioned to this Provc by the neglect of so necessary a point, as that of fixing their boundaries, and the dispute still subsisting with the Provinces of Jersey and the Massachusets, have engaged me in this undertaking, and as the lands thereabout are intirely uncultivated, I shall have no disputes to encounter with, by the claims of persons, pretending to be proprietors of the soil, and a matter of this kind is of course much more easily settled than in a cultivated country…..” At this time, some land had been allocated to soldiers on both sides of Lake Champlain and had even been surveyed but the proprietors did not want to settle until the province boundary and uncertainty of the French land grants were settled. Letters written by Governor Moore show that he was under pressure to resolve these boundary questions. Expeditions to Lake Champlain were planned for the spring of 1767 so it was imperative that the surveys be started. Each month's photograph has a detailed history written about the picture. 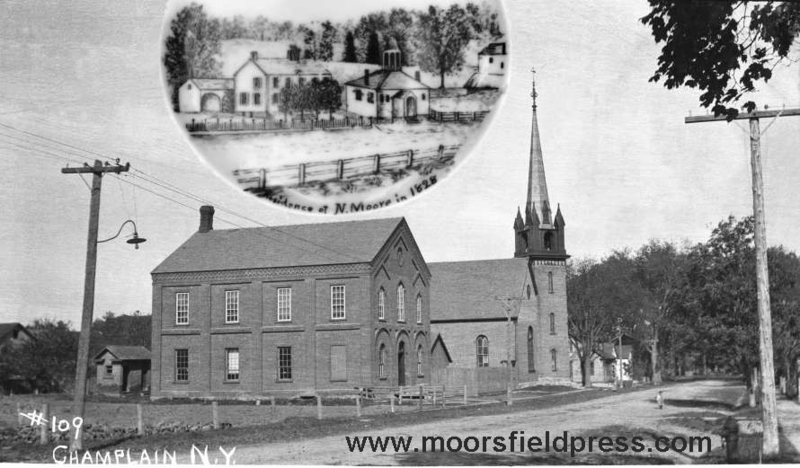 The cover photograph shows a very unusual and hard to find picture of St. Mary's frame church building in Champlain Village taken around 1880 five years before the stone church was built. The history of the brick school on Church Street, the George Perry Store in Perrys Mills, St. Joseph's Church in Coopersville and Fort Montgomery and Fort Blunder are also described. COVER: St. Mary’s Church in Champlain Village (150th Anniversary - 1860-2010). NOVEMBER: The Suburban Transportation Company. Read about the 2011 Champlain Historic Calendar in a local newspaper. All images in the 2011 calendar are courtesy the Special Collections, Feinberg Library at Plattsburgh State University College, the Clinton County Historical Association in Plattsburgh, the Samuel de History Center in Champlain or the author. This calendar, with a 11 page historical essay will benefit the Glenwood Cemetery Association of Champlain. It can be purchased at many locations in the Champlain and Plattsburgh areas.